One of the highest paying dividend sector mutual funds is Real Estate sector funds. This Real Estate fund is also known as REIT mutual fund. 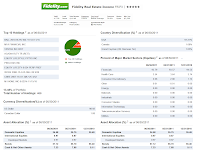 Fidelity Real Estate Income is one of the best sector equity fund. You can use this fund to diversify your asset allocation. Details about the fund's review is below. The Fidelity Real Estate Income fund objective is to provide higher than average income. This Fidelity fund generally invests its assets primarily in REIT preferred and common stocks; real estate entities debt obligations or bonds; and commercial and other mortgage-backed securities, with an emphasis on lower-quality debt securities. It invests >80% of assets in securities of companies principally engaged in the real estate industry and other real estate related investments. The fund may invest in foreign issuers and domestic issuers. This Fidelity fund is a no load fund, meaning it has neither management fee nor front-end sales load fee. It has current total net assets of $1.77 billion. The fund’s expense ratio is 0.96% per year. It also has a yield of 4.72%. The fund has been managed by Mark P. Synderman since its inception in February 2003. This FRIFX fund has gotten 5-stars rating from Morningstar. Based on load adjusted return, this fund has returned 16.47% over the past year and 4.97% over the past five years. This REIT fund has its best performance year in 2009 with 46.82%. Its worst performance return occurred in 2008 with -31.02%. This fund has 4.97% of 5-year average return. The minimum balance to open either brokerage or retirement (IRA) account of this fund is $2,500. There is no minimum subsequent investment needed. This best rated Real Estate sector fund is available to many investors. Investors can purchase this fund through 61 brokerages, such as JP Morgan, T Rowe Price, Schwab RPS SDE, TRUSTlynx, Td Ameritrade, Inc, Pershing Fund Center, Vanguard, etc. The other classes of this fund are Class A (FRINX), Class C (FRIOX), Institutional Class (FRIRX) and Class T (FRIQX). 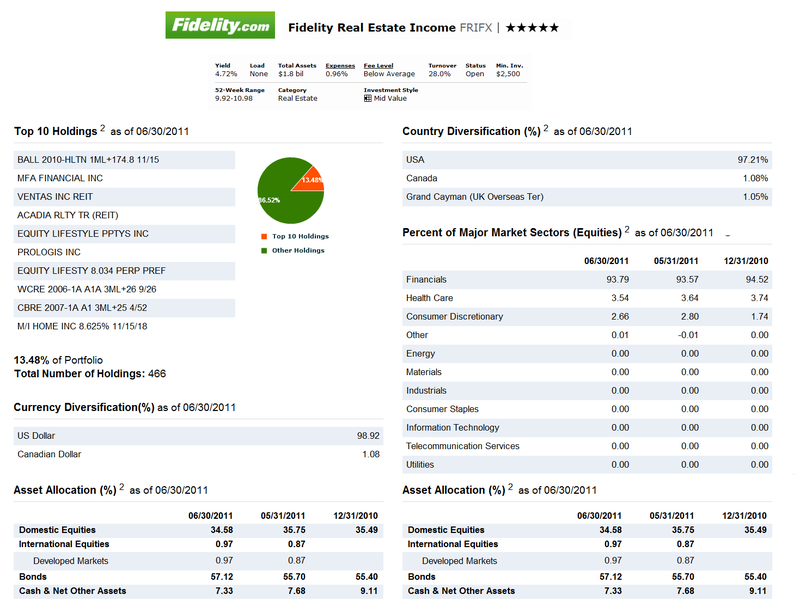 This Fidelity Real Estate fund has a total of 466 holdings as of June 2011. The top ten holdings are Ball 2010-Hltn 1ml+174.8 11/15, Mfa Financial Inc, Ventas Inc REIT, Acadia Rlty Tr (REIT), Equity Lifestyle Pptys Inc, Prologis Inc, Equity Lifesty 8.034 Perp Pref, Wcre 2006-1a A1a 3ml+26 9/26, Cbre 2007-1a A1 3ml+25 4/52 and M/I Home Inc 8.625% 11/15/18. The major market sectors (equities) are Financials (93.79%), Health Care (3.54%), Consumer Discretionary (2.66%) and Other (0.01%). Investment Risks for investing in this Real Estate stock fund are: Stock Market Volatility, Interest Rate Changes, Foreign Exposure:, Real Estate Industry Concentration, and Prepayment risk, and Issuer Specific Changes.